Looking for JuicePoint 10A plug in chargers like the JuiceCord and EVI chargers? Both these products are now retired. 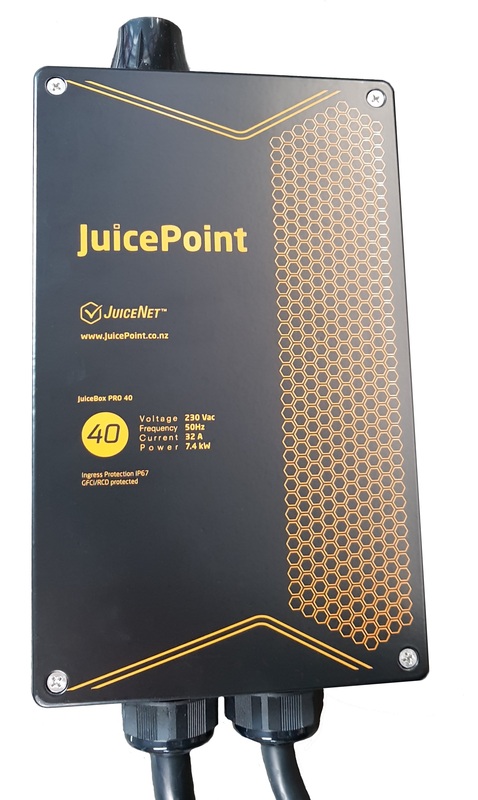 JuicePoint’s recommended alternative is the JuiceBox 40 T1 or JuiceBox 40 T2 for most customers charging at home. The JuiceBox 32 is recommend if 3 phase power is available. Why is a JuiceBox Better than a Plug in Charger? Plug in chargers were only recommended for occasional charging. They are referred to as “trickle chargers” – which is fine for a Nissan Leaf with a 24kW battery, but it quickly becomes impractical with newer EVs with larger batteries, for example a Tesla with 100kW battery will take over 2 days to fully charge! See our how fast to charge article. Plug in chargers are limited to 8A by WorkSafe, Wall Boxes can charge at up to 32A. WorkSafe requires a dedicated circuit for the charger. Upcoming wiring regulations will make the installation cost comparable to a Wall Box anyway. Be very cautious buying a plug in charger that they meet WorkSafe requirements and applicable standards for New Zealand. Refer here for more information.